After seeing Adele’s second album, 21, at the top of the charts throughout 2011, it is no surprise that it was the highest selling album of the year. What is surprising, though, is how many copies were sold. The year-end Soundscan figures were released last week, showing that 21 has sold over 5.1 million copies, making it the first album to sell over five million copies in one year since 2004, when Usher’s Confessions sold 7.9 million copies. Both of Adele’s albums, 19 and 21, were named for her age when making the albums. On May 5th, 2009, Adele played Roseland Ballroom in New York, as one of the last shows of her “An Evening with Adele” tour. This date also happened to be her 21st birthday. By then, Adele had been touring for nearly a year and 19 was a big success, so I was surprised that I was only one of two photographers covering the show. After shooting the first three songs of the set from the pit in front of the stage, I was told that it was Adele’s birthday and a surprise was planned which I should stay to photograph. 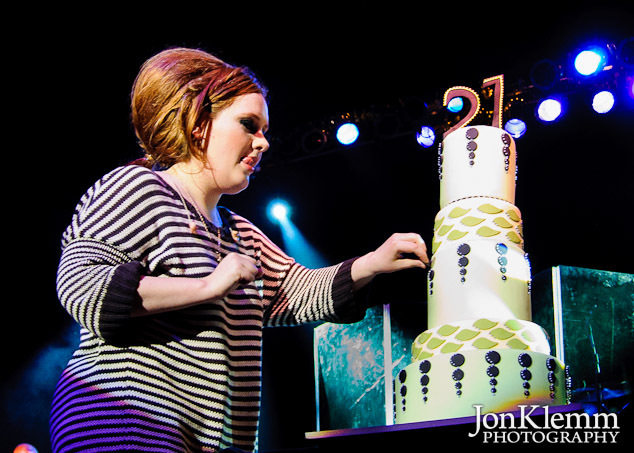 At the end of the performance, a cake was rolled out onto the stage and balloons were dropped over the audience as they sang “Happy Birthday” to Adele. Click here to see the full photo gallery from the show. This entry was posted in Concert Photography and tagged Adele, Roseland Ballroom.